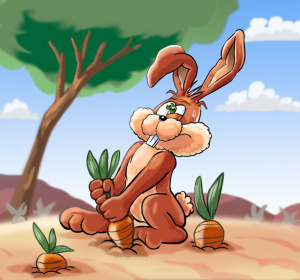 If you’ve owned a Samsung mobile phone in the past few years then the name Bobby Carrot will probably ring a bell. German developer FDG Entertainment has so far produced five games featuring this insanely popular buck-toothed character, and the company has recently contacted WiiWare World exclusively to confirm that a version of Bobby Carrot Forever is currently in development for WiiWare. Details are sketchy at present due to the early stage of production, but we're expecting it to be an enhanced version of the the fifth (and most recent) entry in the franchise. The game is also making its way to Apple’s iPhone. For those of you that don’t know, Bobby Carrot Forever (like all the other instalments) is a puzzle adventure game in which the core aim is to collect carrots. The series has racked up over one million downloads on mobile phones, which is pretty impressive going. There’s no solid release date as yet, but in the meantime you can check out reviews of previous Bobby Carrot games here. Update: Screenshots added to our gallery below from the upcoming iPhone version which is said to be very similar. So it's a successfull German game, which I've never heard of before? Hmm... mobile games are usually only fun for about 15 minutes at a time, but I'll keep an open mind about this if it's that popular. I know the game/company, though I'd prefer Comic Blast or DDD. Bobby Carrot is okay, but I wouldn't get it on WW. Never heard of this. Hope its good. How long will we have to wait for this? I'm not interested but you never know who will buy it. Damm it, i wanted to be the first to mention Duke Nukem. Wow the Duke Nukem Forever saga continues. I'm going to try out these mobile phone versions of the game and see how they are. It sort of reminds me of that rabbit game that came on the old Apple II "Apple Presents the IIe" diskette years ago. But will it be better than Batman Forever? Hmm... Tough call Tony. What about Diamonds Are Forever? When it comes to games, i don't generally trust ones with "Forever" in the title (Thank you Duke). I wonder how Duke Nukem would be doing now if the game didn't have "Forever" in the title, like a warning to gamers. At least it seems to finally be nearly done after all this time. The guy who named it must be some sort of modern day Prophet. Never heard of this but it looks decent. Wonder how the WW version will differ. Idc because I got Mega man 9 to keep me occupied. Hell. If jumping around as a plumber who takes shroomz, flying a starfighter as an anthropomorphic fox, or devouring enemies' souls with a pink marshmallow vacuum cleaner works, then why not a German anthropomorphic rabbit eh*? Looks like it will come out in Europe. It is being developed in Germany. Why does it always amaze me so much every single time I see it suggested that people actually play games on their phones? Anyway... Anybody else kind of reminded of the Quik bunny by this "Bobby" character? OK, so some people who haven't played it before....are slating it. Bobby Carrot is a fun game. I have it on my Samsung Mobile and it's far from a kiddies game, as some of the challenges can be seriously tough. @MuljoStpho: Mobile games (excl. iPhone, for obvious reasons) always leave me thinking "why?" - although it's admittedly a good format for classic puzzlers (eg Tetris). Games like Guitar Hero, Spore and Worms just don't work though, due to the awkward buttons, technical limitations and small screen. I bought "Crosspix" a couple of months ago though on the T-Mobile store for a quid, which was not only a decent Picross knock off, but also a great bargain. @ILoveWii: I agree - when games look "childish", it's a real shame that fans of brown are put off - especially in the cases of titles such as Zelda: Phantom Hourglass and Zack & Wiki. Why are there ads for other consoles on a wii based site?! I bet you wont find any PS3 or 360 website advising wii games, why is this site?! @LAA- I don't think the ads are hand-picked; I think they're random video game ads. I could be wrong, though. @LAA: I've often thought that. At the moment, I can see ads for Oyster cards, but the only Wii ad I've ever seen is a Manhunt 2 one, whilst websites such as CVG have displayed ads for Trauma Center and Animal Crossing, among others. @LAA the adds by Google are generated based on words on a page. Did this remind anyone else that we absolutely NEED a Bugs Bunny game? and maybe a Daffy Duck game? @gameking23: I don't know if this is correct, but the ads may be different in NA to what they are like here. Here's a screenshot of what the UK WiiWare World currently looks like.